Hollywood glam style gives a modern look to the interior and is decorated with luxurious materials. The style is decorated in various textures with smooth and clean furnishings. 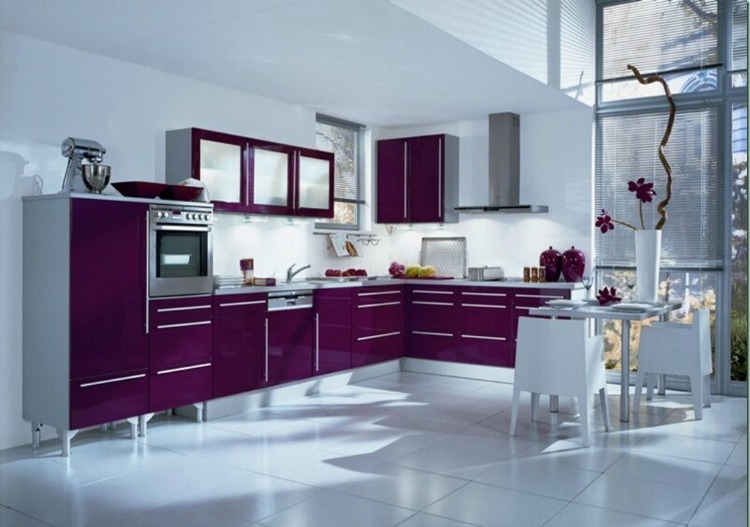 Here are few images of hollywood glam style kitchen room which may be useful in decorating your interior. Generally the kitchen consists of cabinets, counter, chimney, faucet, refrigerator, canister, trash compactor, groceries, ladle, whisk and chairs. Few people arrange counters which can be used for consuming food or to prepare food and some may place dining table for consuming food. 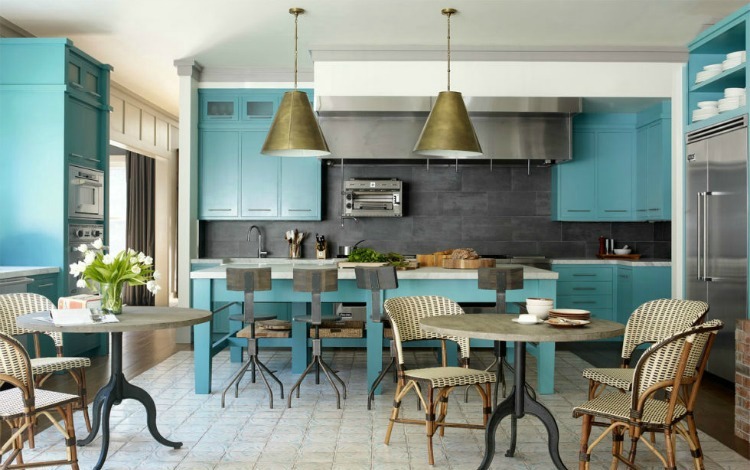 The kitchen room can be designed in hollywood style even if it has small or large space but the interior is opulent and you feel pleasant. 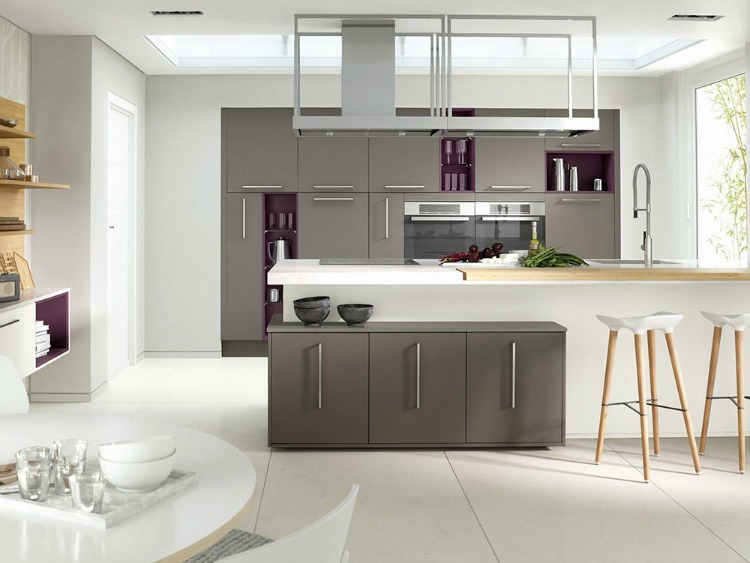 In the view of the image you can see a holly wood glam style kitchen with a glossy look. The interior is decorated with white wooden roll up jalousie from which we can get fresh air and make you feel pleasant. The interior has paneling with cabinets of glass doors to store groceries and has purple cabinets with an inbuilt micro wave oven. The false ceiling is dry wall ceiling and the flooring is made of white ceramic tiles. The room also has a rectangular dining with chairs to cram food and has a chimney to make the room clean. The counter has many edible items and can store stainless steel accessories. This image views a kitchen room of holly wood glam style and false ceiling is dry wall ceiling. 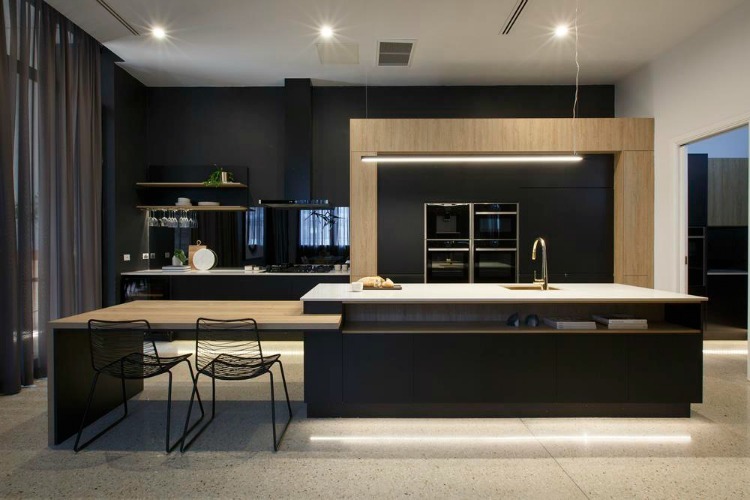 It has a drop out structure with recessed lights and has a pendant lamp attached to the roof. The flooring has white ceramic tiles and has a chimney attached to the roof which makes the room smoke free. The wall is decorated with snowy white and beige wall paper on which a wall clock is mounted. The room has tile cladding on the wall on which ladle, whisk, spoons on to the stand and has closets decorated with ceramic tea cup set. There are modern black cabinets on which canister, stove, toaster and inbuilt micro wave oven. The false ceiling is dry wall ceiling with cone shaped pendant lights attached to the roof and has laminated wood on the flooring. The flooring has a carpet laid on it and the interior has tiles cladding. The room has tiffany blue cabinets and has built in micro wave oven. The room has refrigerator and has closets with ceramic bowls and has stainless steel accessories. The room has dining table with chairs for consuming food and can be decorated with ornamental plants for dramatic effect. The interior has a counter with stove, faucet and has island with chairs. In the view of the image you can see a simple kitchen room with a dining. The false ceiling is a dry wall ceiling with simple light fixtures and has a paper chandelier attached to the roof. The room has a casement window for viewing outdoor and has wall paper which is amazing. The interior is decorated with wall sconces and has closets with ceramic bowls, glass jars. The cabinets has flat panel and the counter has stove, faucet and chimney surrounded with wall cladding which acts as outlet for smoke. The flooring has plain vinyl flooring and has a textured carpet laid on it. There is a rectangular wooden dining with black timber chairs. This image has a hollywood glam style kitchen room and has false ceiling is a drop out ceiling with simple light fixtures. The room has chimney attached to the roof and has a stove, faucet,sink on the counter. The room has intrinsic micro wave oven and has cabinets to store accessories. The cabinets are decorated with glass jars, ceramic bowls, cups and all the kitchen ware. There is an ornamental plant which makes the room to look fresh and has counter with the chairs for consuming food or having casual drinks. The flooring is made of ceramic tiles with a glossy look. The false ceiling is dry wall ceiling with light fixtures, string light and has textured ceramic tiles. The interior is decorated with grey sheer draperies and has wall cladding. It has a long black chimney attached to the roof which make the room smoke and oil free. The room has black wall paper and closets decorated with kitchenware. There is a island with a faucet and closet for storing groceries. A wooden counter is attached to the island which serves as a dining and has dining chairs for seating. In the view of the image you can see a dry wall ceiling with simple light fixtures, pendant lights and has chimney attached to the roof. There is a L shaped kitchen with cabinets and has glass cabinets. The room has counter for storing stainless steel accessories and has island with faucet and stove. The island on the other side can be used as dining for consuming food which has chairs and has inbuilt micro wave oven, refrigerator. The flooring is made of plain vinyl flooring and has flower pots on the counter. 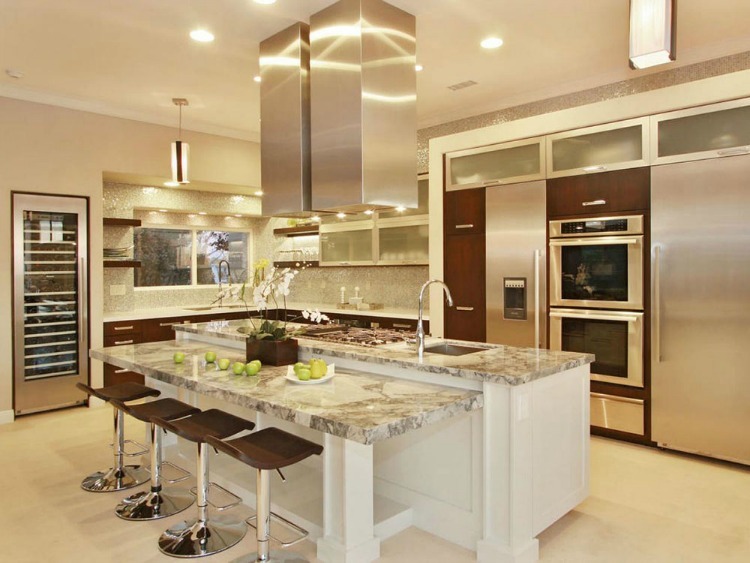 This design of kitchen is well suited for small interiors with I shaped kitchen and has island. The false ceiling is dry wall ceiling with plain light fixtures and has string chandeliers, candle chandelier attached to the roof. The interior is decorated with the eyelet draperies and roll up jalousie. The room has glass closets which has display items and has wooden frame. 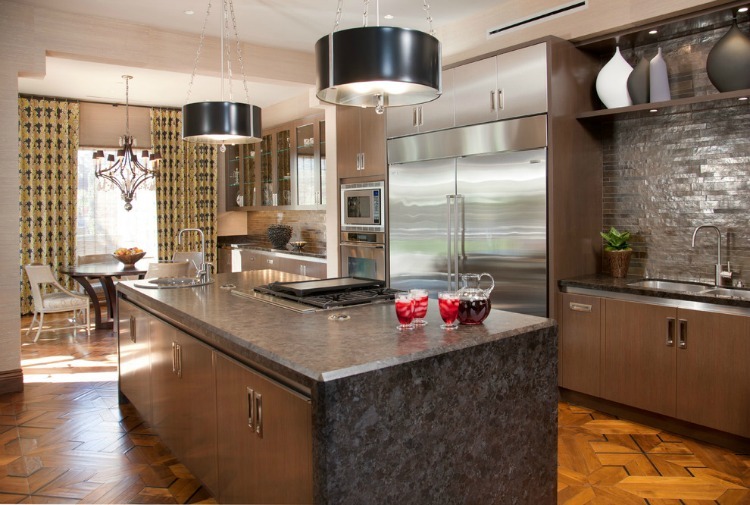 The flooring is made of laminated hardwood flooring and has an island with marble. 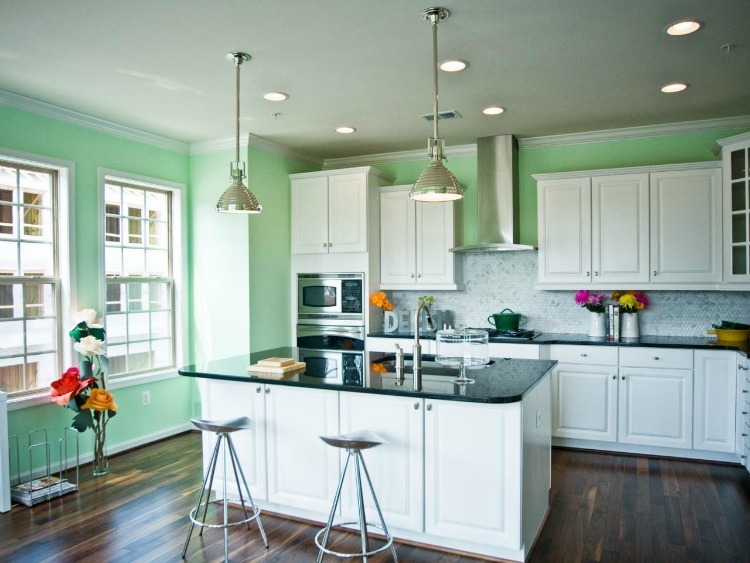 The island has cabinets where you can store the kitchen ware and it also has a round dining with chairs around it. In the view of the image you can see an elegant kitchen room of hollywood glam style. The ceiling is a pop ceiling with recessed lights and has glossy ceramic white tile flooring. The interior has metal chimney which makes the room oil and smoke free. The interior is decorated with the picture windows and can view beautiful outdoor. The room has wooden closets decorated with display items and has grey, mauve color shades with inbuilt micro wave oven. The room has an island for preparing food and can be even used as dining. The room also has orbed dining with chairs and has laid carpet on the flooring. In the view of the image you can see a stunning holly wood style kitchen room and the room has white framed glass windows. The interior is decorated with flower pots which are colorful and is L shaped kitchen with an island. The false ceiling is dry wall ceiling with simple light fixtures and has a metal chimney attached to the roof. The counter can be used as both dining and for preparing food. These type of designs can be preferred when the interior is small and the flooring is made of laminated hardwood.